Lenovo a robust all-in-one PC that lacks a touchscreen but packs good punch for yer pound. 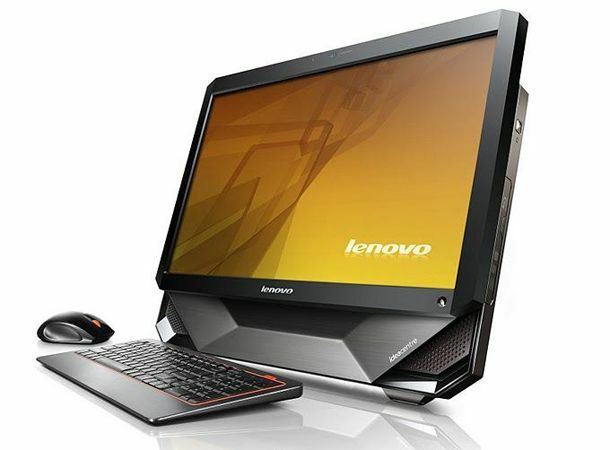 Lenovo's Ideacentre B500 (0887-4AG) will split the all-in-one fanboys right down the middle. The robust angular brushed metal and orange grille feel a touch gauche compare to the cool sleek minimalism of the others. It doesn't look or feel like a flat panel with PC inside – it looks like a gamer's PC that has shed a few pounds to squash in to a relatively small frame. That frame is robust though and it has a solid kickstand at the back. We love the brilliant Bluetooth mouse and keyboard that maintain the same vibe as the PC with an orange imprint over a gun-metal grey finish. These are optical and wireless with the IR receiver already built into the back These proved to be responsive enough for any task we threw at it, including ninja reflex gaming. Round the back Lenovo has put the four USB ports, an Ethernet port, TV tuner and an old school out of place PS/2 port. The left hand side houses another two USB ports, multi-format card reader and a couple of audio jacks. Primed for multimedia tasks, including brilliant JBL speakers, we were surprised to see Lenovo has left out a HDMI port. You also won't be getting your grubby mitts on a Blu-ray player as this bad boy only supports a multi-format slot loading DVD drive. If you can live without a HD player, you will be most pleased with the 23-inch screen. The centre piece of is its excellent 1080p HD screen. For a change, it is matte rather than gloss so it isn't quite as vibrant for multi-media as the rest of the models. But it makes this unit better served for multi-purpose tasks. That said, the viewing angle is generous and it well lit so we had no issue to report gaming in HD or streaming You Tube HD content. While the Ideacentre B500 lacks a touchscreen, Lenovo has still deigned to give it a comprehensive bundle of its own Vantage Tecnololgy multimedia management stuff. This in part is due to a motion sensor remote control that can be wielded like Wii controller. The games are limited and it's not as accurate but we look forward to seeing where Leonovo take the idea in future iterations. It also makes passing your time while you're downloading anything much more fun. Lenovo is very generous with the specs at this bargain price. The Ideacentre B500 0887-4AG includes superb next gen gaming ATI Radeon HD 5570 graphics with 1GB. You also get 4GB, a big 1TB hard drive and Windows 7 Home Premium 64 bit. That is enough firepower to cope with Call of Duty: Black Ops without any lag. In fact, we pushed this AiO PC all the way up to HD quality with settings maxxed to full and still got 35FPS. It might be a sin not to offer a touchscreen on all-in-one PCs these days but Lenovo packs everything else and the kitchen sink in for a bargain. Anyone buying it won't be let down with it's all-round multimedia savvy and performance.